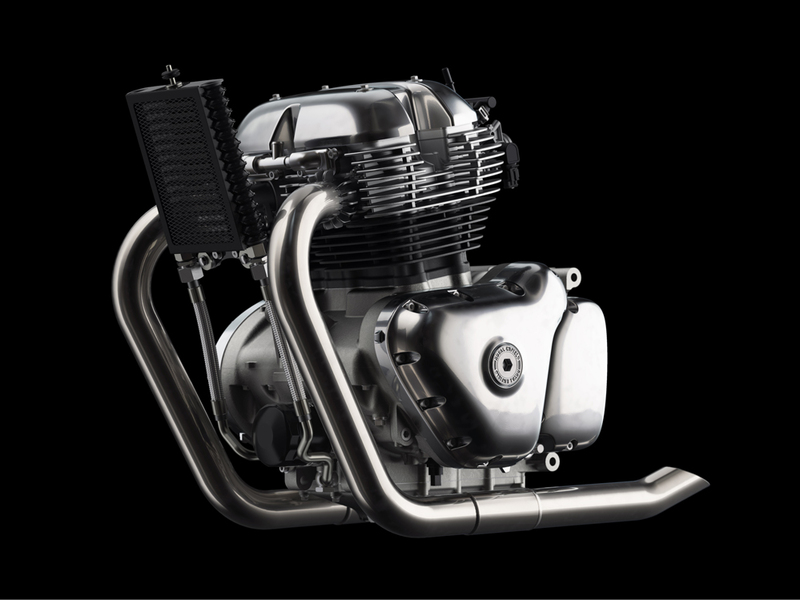 Royal Enfield returns to the parallel twin format as its flagship motor. 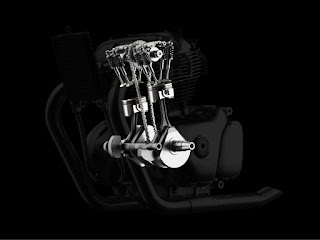 The new Royal Enfield parallel twin motor unveiled yesterday in Leicestershire, England is undoubtedly a landmark. For Royal Enfield it could mark a return to glory after half a century of producing (sort-of-slow) single-cylinder motorcycles. 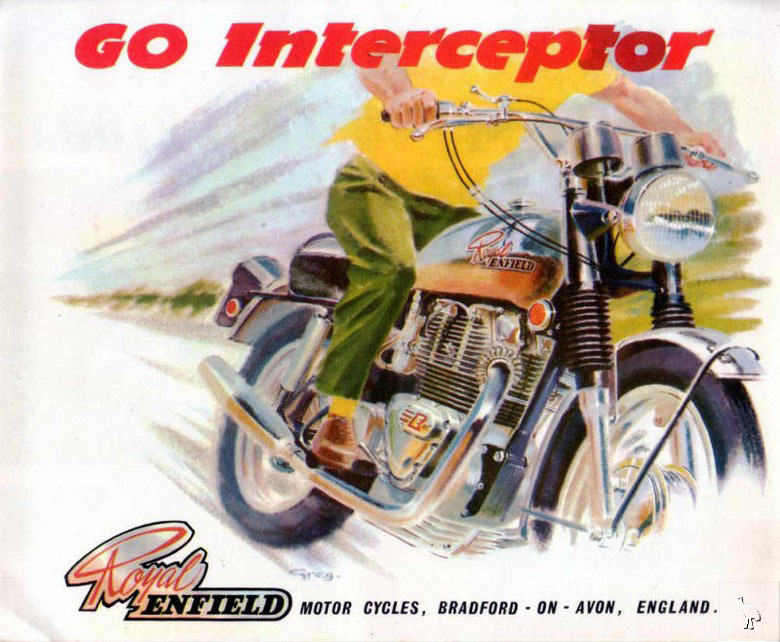 Almost 50 years ago, Royal Enfield, a pioneer maker of British motorcycles, closed up shop, ending production of the Interceptor and its mighty, 736cc parallel twin. 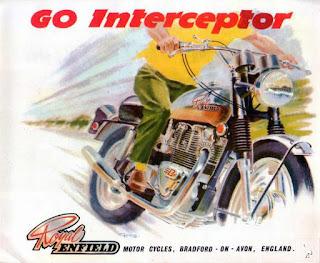 The Interceptor and its motor had been among the biggest, hairiest products of the last days of the British motorcycle industry. Royal Enfield of India carried on building the single-cylinder Bullet, beloved in India, but, at 350 or 500cc, limited in power. The new 650 leans forward, as if into the wind. It's a bit of what used to be called "a sloper." 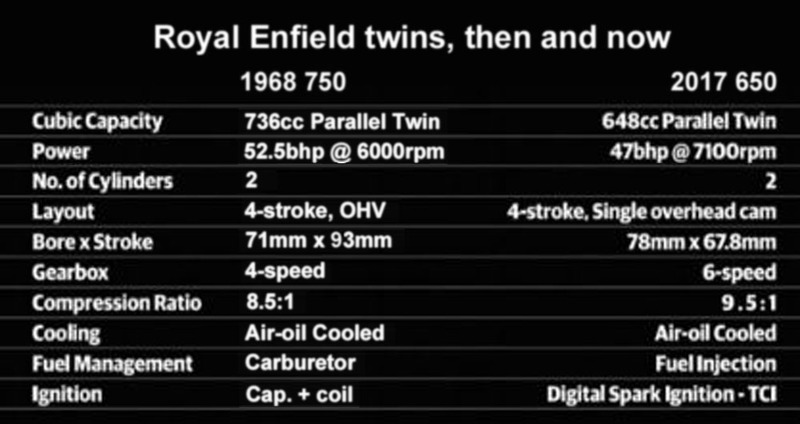 The new motor is 648cc but will be called a 650, as the 736cc Interceptor of old was always called a 750. It's an air-cooled motor, with twin exhaust pipes, like the original, but has an overhead cam instead of push rods. It produces 47 bhp, about what the original would have done. Royal Enfield boss Siddhartha Lal has been quoted to the effect that the new motor, originally 600cc, was increased in size to make certain it could push a motorcycle past 100 mph. An overhead camshaft brings Royal Enfield into the 21st Century. 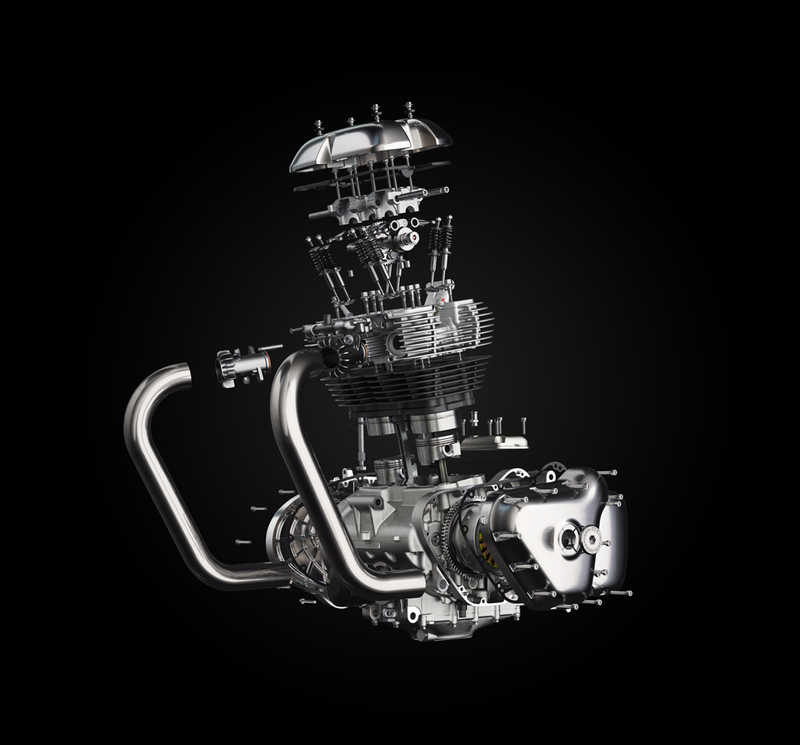 The press release gives credit for the new motor to Royal Enfield's UK Technology Centre and Chennai, India teams. Royal Enfield, now based in India, is obviously proud. The press release calls the motor "beautifully clean and essentially pure, like the experience it provides." Even in the exploded view, the new 650 looks compact and tidy. 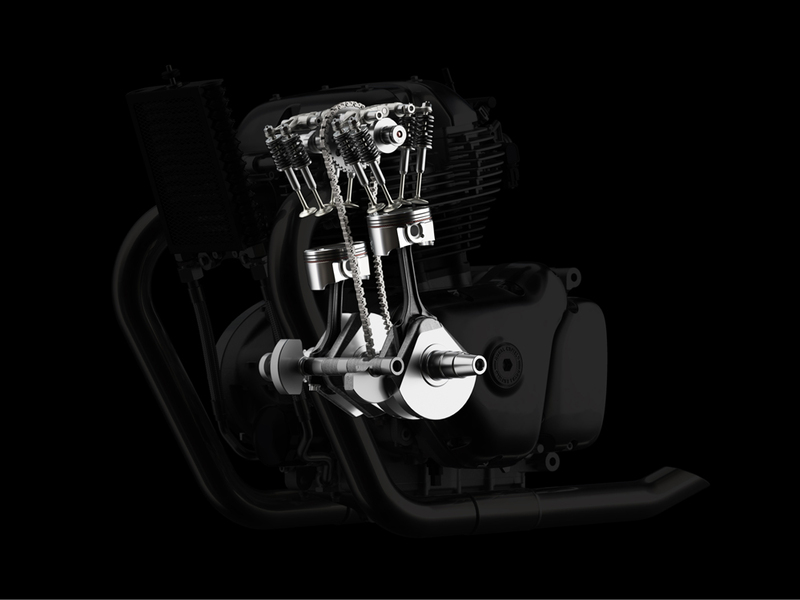 "The engine maintains an under-stressed 9.5:1 compression ratio and fuel injection system ensures that smooth, accessible power is available at all times." Between the lines, "under stressed" sounds like a promise of reliability, something the Interceptor motor of the 1960s, like most products of its time, achieved only with careful care and attention to problem areas. Talking about under stressed, consider that the new motor has a stroke of 71mm. The Interceptor of a half century ago had a stroke of 93mm! I would guess the shorter stroke will pay off in less piston travel and vibration. as was the motor of the 1960s, in its final form. To my technically unsophisticated eye, the new motor appears tidy and compact, while the sprawling motor of 1970 looked awesome. You couldn't take your eyes off the naked original. The new motor looks as though it wants to do its work tucked inside bodywork. that a period ad didn't bother showing much of the rest of the bike! Most riders will look for its true beauty in its performance. 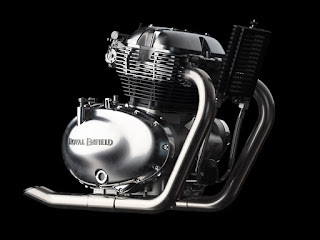 It is, as the press release headline states, Royal Enfield's "first modern 650 twin engine." The testing ground of the real world awaits. 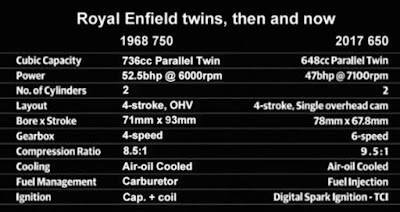 Chart compares the 750 Interceptor of 1968 with the new Royal Enfield 650. When is this Enfield motorbike coming out in the market? Engine looks to have similar performance to mid- 1970s Triumph Bonnevilles. With a 6-speed gearbox, the bike should be able to cruise easily at 65 mph at about 3200 rpm. The stroke is low. They did what Triumph did to the new Bonneville engine i gain power through higher RPMs. I am afraid, just like my Thruxton, it will not sound or feel good with that completely different characteristic. By the armoured gusset of Boadacea's battle drawers ! Royal Enfield have FINALLY produced a a ruddy twin AT LAST . I suppose one should run up the flag on the east tower or some such damned nonsense . But a humble 650 ? Even with a (21st century) SOHC and 4 valves per cylinder . One hopes that the motor was designed with further development in mind - don't yer know . Hope there's enough meat between the cylinders to bore the blighter out -quite so . Bunty had been looking forward to an earth stomping torquey fire breathing bloody dragon to power his new sidecar outfit . This is akin to raising one's male first born to the age of majority and thence to be informed by said offspring that he will not join the regiment but is intent upon becoming a hairdresser . I shall drown me sorrows with a magnum bottle of Meteor et Interceptre 69 and hope the bikes yet to be revealed are not so modest . Good grief ! One can but hope . Maj Bunty Golightly . MBH,Defender of the Kickstart . Overhead Camshafts have been fitted to production vehicles since 1897 - quite so . And they didn't go for a 750cc because....why ? India TV asked Siddhartha Lal that question. He said it was the "one-step up" from the existing product line, the 750-800cc market is "crowded." And it will still do 100 miles per hour, he said. Ive got a well sorted 1969 series II and I have no complaints, for me, I don't think that I will bother with ponying up any cash for a new 'Interceptor' for a few years until the real world results come in. With the new offering, it seems to me to be a downgrade.